Newcastle owner Mike Ashley has said he's 'hopeful' that he'd like to sell the club 'before the January transfer window'. Stop us if you've heard that one before. Of course, those hopes were shattered in January as talks between the two parties concluded without an agreement. Fast forward to December 2018, and Ashley has once again announced that he's looking to sell the club. Speaking to ​Sky News, Ashley said that he is in talks to sell ​Newcastle United, with discussions 'at a more progressed stage than they have ever been'. 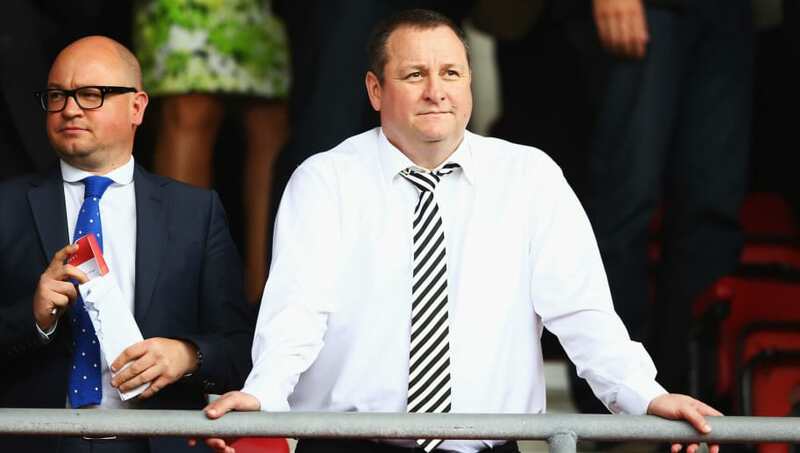 Mike Ashley has informed prospective buyers that he wants a deal done by December 31, but discussions have not progressed at a pace he would like. The Toon Army will take Ashley's words with an Everest-sized amount of salt, with many viewing Ashley's 'attempts' to sell Newcastle last year as simply being a ploy to detract from his poor running of the club and to prevent him from spending in the January transfer window. They fear that he might be trying the same tactic again - and who could blame them? However, a report from Luke Edwards at the ​Telegraph might offer Newcastle fans more concrete hope than ever. Edwards claims that non-disclosure agreements were signed last month, and it is thought that there are 'at least' two bidders who are serious about buying the club, and maintaining their secrecy in order to push a deal through. Those rumoured parties include former Chelsea chief executive Peter Kenyon, a Turkish consortium, and there are claims a 'multi-billionaire' who 'is not from the USA' has made an 'acceptable' bid for the club. Edwards claims that Ashley going public regarding the interest from multiple groups in Newcastle could be a negotiating tactic in order to drive up the price for the club. Ashley, who bought Newcastle in 2007 for £135m, has set an asking price of £300m for the Magpies. “I am hopeful – for the Newcastle fans, for the club, for everybody, that I will be able to step aside and we will be able to get an owner in that will please everybody,” Ashley told Sky News. “I'd like it to be before the January transfer window. [Is that] Realistic? It's possible. Realistic is maybe too strong a word. Hopefully, we can carry on the good form – the just recent good form – and we can get the deal done." There are rumours circulating that Ashely, via his lawyers, has spoken with buyers but is yet to see evidence of proof of funds, whilst some senior Newcastle staff members are believed to be 'skeptical' about how honest Ashley was during his Sky interview. Let's not forget that Ashley has often used the media entity as a platform to make some outlandish statements, including saying that he doesn't have 'cash in the bank' and that manager Rafa Benitez could have 'every penny we [Newcastle] generate'. So once again, the Toon Army seems to have come full circle. The January transfer window is approaching, and Mike Ashley, yet again, is claiming that he wants to sell the club before the window opens. Fans are doing their best to not be lured into a potential Christmas fairytale that will be ruined by the Grinch. But one prevailing thought rests in the mind of every Magpies fan: We don't care who Ashley sells to - just as long as he finally, mercifully, sells.